For more about this video and full access, click here. World J Emerg Surg. 2012; 7(Suppl 1): S11. Copyright ©2012 Marttos et al; licensee BioMed Central Ltd.
Videourology™, the online peer-reviewed complement to Journal of Endourology, offers high-caliber video demonstrations of the latest cutting-edge robotic and laparoscopic surgical techniques and technologies as well as urologic endoscopic treatments designed to enable physicians to view and evaluate new minimally invasive and noninvasive techniques and apply them to their practice. Videos can be easily searched, viewed online, and downloaded in Flash, QuickTime®, and MP4 formats for use on a tablet or other mobile device allowing on-the-spot access where and when it is desired. Videos can be downloaded and shared with colleagues, facilitating optimal patient care. Videourology is included in your subscription to Journal of Endourology. Groundbreaking Videourology Journal Launched by Mary Ann Liebert, Inc.
Videourology™, the online peer-reviewed complement to Journal of Endourology, offers high-caliber video demonstrations of the latest cutting-edge robotic and laparoscopic surgical techniques and technologies as well as urologic endoscopic treatments designed to enable physicians to view and evaluate new minimally invasive and noninvasive techniques and apply them to their practice. Videos can be easily searched, viewed online, and downloaded in Flash, QuickTime®, and MP4 formats for use on a tablet or other mobile device allowing on-the-spot access where and when it is desired. Videos can be downloaded and shared with colleagues, facilitating optimal patient care. Videourology is included in your subscription to Journal of Endourology. Selected videos in Videourology are included in the AUA Core Curriculum. Journal of Endourology, JE Case Reports, and Videourology are under the editorial leadership of Co-Editors-in-Chief Ralph V. Clayman, University of California, Irvine; Arthur D. Smith, The Smith Institute for Urology; Executive Editor John Denstedt, Western University; Videourology Section Editors Chandru Sundaram, MD, Indiana University School of Medicine; and other leading investigators. View the entire editorial board. Finally, urology residents within North America and selected residents in Europe receive a free journal subscription during their residency, subject to industry support. Join the Society or renew your membership today. Attention members of the Endourological Society: Please contact liebertonline@liebertpub.com for information on accessing the Journal online if you have not already done so. Follow the Endourological Society on Facebook. Access to Videourology is included with a subscription to Journal of Endourology. PODCAST: Drs. Arthur Smith and Ralph Clayman founded Journal of Endourology in 1987, and continue in their role of Co-Editors-in-Chief today. In this interview conducted by Dr. Clayman, Dr. Smith shares the remarkable story of how he pioneered the field of videourology 30 years ago, what led to the launch of the journal Videourology™, and how this groundbreaking new resource will enhance physician education and improve patient outcomes. 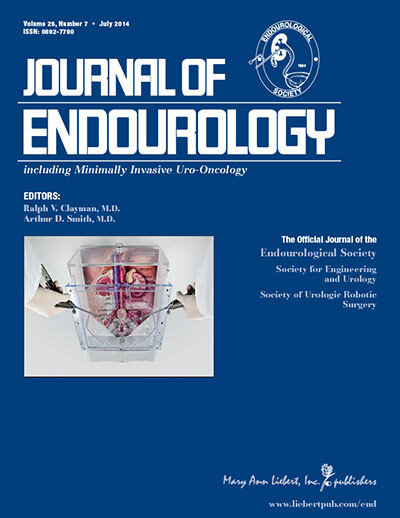 Mission: By virtue of a stringent peer review process, Journal of Endourology seeks to provide the urological community with leading edge, scientifically rigorous studies in minimally invasive and non-incisional urologic surgery. All aspects of endoscopic, laparoscopic, robotic, and image-guided procedures as they apply to benign and malignant diseases of the genitourinary tract are central to our mission. Vision: Evidence-based endourologic education of the medical community will bring our patients high quality, patient-oriented care providing the most rapid return of their well being. VideoEndocrinology®, delivers high-quality peer-reviewed videos of cutting-edge surgical and diagnostic imaging techniques and technologies covering thyroid, parathyroid, pancreatic, pituitary, and adrenal tumors and diseases, with minimally invasive, robotic, and open surgical procedures. This rapid publication videojournal offers a dynamic new venue for physicians and surgeons to share their techniques and showcase new approaches. Videos can be easily searched, viewed online, and downloaded in Flash, QuickTime®, and MP4 formats for use on a tablet or other mobile device allowing on-the-spot access where and when it is desired. Videos can be downloaded and shared with colleagues, facilitating optimal patient care. VideoEndocrinology is included with your subscription to the monthly flagship Thyroid. Videoscopy®, the online complement to Journal of Laparoendoscopic & Advanced Surgical Techniques (JLAST), offers high-caliber video demonstrations of peer-reviewed, cutting-edge surgical techniques and technologies designed to enable physicians to view and evaluate new surgical and microinvasive techniques and apply them to everyday surgical practice. Videos can be viewed or downloaded in Flash, QuickTime®, and MP4 formats for use on your tablet or other mobile device allowing you on-the-spot access where and when you need it. Videos can be searched, downloaded, and shared with colleagues, facilitating optimal patient care. Part B, Videoscopy is included in your subscription to Journal of Laparoendoscopic & Advanced Surgical Techniques.